Compare prices on car hire in Brest from all the major brands and find the best deals. When you book through us, unlimited mileage and insurance are always included in the price given. Brest is located in the northwestern part of France – in Brittany.The city belongs to the Ministry Finestere and has 144,548 inhabitants (2006). Ever since the 1600s has there been a military naval base here. Today it is operated by NATO. Brest is also an important commercial and industrial. Among the city’s attractions include the Pont de Recouvrance – a vertical hevebro the river Penfeld, built in 1854. It connects the important cultural and historical street Rue de Siam with the district Quart Tier the Recouvrance. Other popular attractions in Brest is also medieval buildings Le Château de Brest and the Tour Tanguy. The two monuments are opposite each other on opposite sides of the river Penfeld – and both houses the historical museum departments. 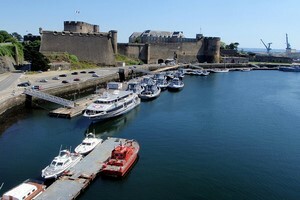 Otherwise, the city has a number of other tourist attractions to offer: the maritime discovery center Océanopolis, the botanical garden Conservatoire Botanique National de Brest and the art museum “Musée des Beaux-Art”. There are several areas near the city with beautiful beaches that tempt both locals and tourists alike. Also interesting caves and granite cliffs, there is here, and in addition to swimming, we also offer activities such as sailing and fishing. The nearest airport is Aéroport Brest Bretagne , located just outside the city.